The increasing burden of noncommunicable diseases (NCDs) in the United Arab Emirates (UAE) constitutes a huge public health challenge, associated with tremendous social, economic, and developmental impact. NCDs – principally cardiovascular disease (CVD), cancer, diabetes, and chronic respiratory disease – are responsible for 77% of all deaths in the UAE, and the probability of dying prematurely (before the age of 70) from one of these diseases is 17%. Furthermore, the top five risk factors for NCDs were dietary risks, high body mass index, high systolic blood pressure, high fasting plasma glucose, and high total cholesterol. These are exacerbated by a range of various demographic and lifestyle changes.,,, Against this background of rising incidence of NCDs, and the need to accelerate actions toward achieving the National Agenda Targets 2021, the Ministry of Health and Prevention (MOHAP), in partnership national stakeholders, and with technical support from international partners such as World Health Organization (WHO), WHO/EMRO, and Gulf Country Council, developed and implemented a National Multisectoral NCD Action Plan. 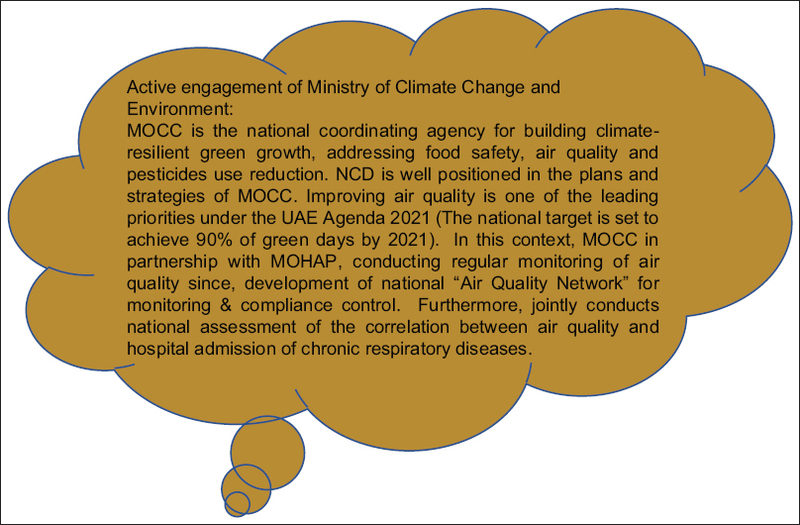 In this paper, we describe the national response to NCDs highlighting the strong leadership of the government at the highest level in the UAE, adopting a multidimensional approach to NCD Prevention and Control, with active stakeholder participation. We discuss the establishment of national multisectoral mechanisms and accountability framework as one of the major milestones in NCD Prevention and Control in the UAE. The UAE government provides a model for high-level commitments and leadership for NCD Prevention and Control. The UAE Vision and National Agenda 2021 are launched by the Vice-President and Prime Minister of the UAE, recognized NCD as a national priority. The UAE National Agenda, which was established by over 300 officials from 90 federal and local government entities, emphasizes the importance of prevention seeking to reduce NCD morbidity and mortality and promote healthy lifestyle. The National Agenda has been put forth as a comprehensive strategy to improve health, education, infrastructure, economy, judicial process and public safety, and overall social well-being in the UAE. The agenda has a set of performance indicators and targets for each of the six priority areas. Five out of the ten indicators for health focus on NCDs and related risk factors to be achieved by 2021 aimed to reduce mortality from CVDs and cancer, reduce incidence of diabetes among population aged 20–79 years, and reduce incidence of main risk factors, namely obesity and tobacco consumption. Furthermore, the National Agenda targets and indicators are aligned well with WHO 2025 targets and sustainable development goal (SDG) targets for 2030, [Table 1]. Acknowledging the need to enhance partnership and whole of government approach as emphasized in UAE National Agenda and SDGs goal, in particular goal 17, deals with strengthening and revitalizing the partnership for sustainable development. Several mechanisms have been established to enhance multisectoral mechanisms and coordination for NCD prevention and control, including national committee and national action plan. The political declaration of the UN high-level meeting on NCDs committed all member states to an inclusive set of actions to treat and prevent NCDs with a certain goal to support national multisectoral action plan. Similarly, the global NCD Action Plan 2013–2020 has emphasized on need to develop multisectoral action plan for NCD Prevention and Control, as one of the overarching principles to achieve the WHO Global Targets 2025. The National NCD Action Plan was developed through a stepwise process of consensus building between the different stakeholders. The MOHAP was keen to initiate the process early in 2013, mainly focusing on situational analysis. A series of consultative meetings were organized to sensitize and motivate all sectors, with the support of the WHO. Subsequently, a draft action plan was developed by the MOHAP and reviewed using a WHO checklist to examine the completeness of a national multisectoral action plan for NCD Prevention and Control. 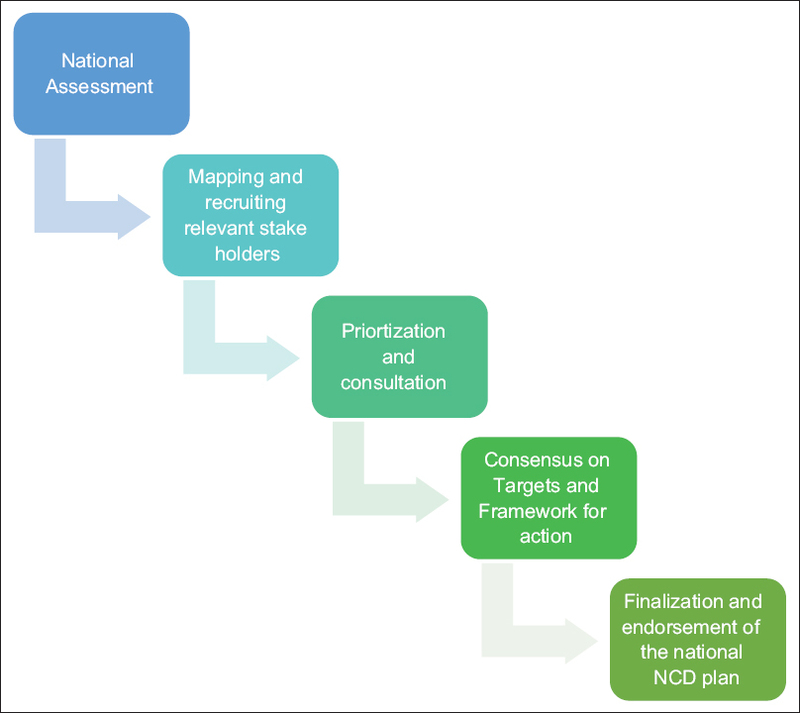 The National NCD Action Plan has four strategic areas: NCD governance; risk reduction and health promotion; early detection; and management of NCDs, surveillance and research, monitoring, and evaluation. There were more than 15 federal ministries and relevant authorities involved in the process of developing and finalizing the NCD National Plan. To facilitate effective multisectoral engagement, a consensus on role and responsibility has been obtained through progress reporting and addressing achievements from all relevant sectors. Agreed on role and responsibilities and progress reporting. The MOHAP as a lead facilitator chaired and acted as the secretariat (the engine) for coordinating monthly meetings. The National NCD Action Plan several population-based interventions implemented in partnership with other sectors. Furthermore, more details on plans and policies targeting main risk factors (obesity, physical inactivity, unhealthy diet) strengthened monitoring and ensured the accountability of each sector [Figure 1] and [Figure 2]. Hack for life, aimed at promoting healthy lifestyle by raising awareness and reduction in salt intake through communication and behavior change. National accountability is needed to ensure that all relevant stakeholders are held accountable for NCD commitments, recognizing that accountability incorporates three dimensions: monitoring of progress, reviewing of progress, and appropriate responses to accelerate progress. Prevalence of Obesity among Children (5–17) years. The MOHAP as the leading agency for health-related NKPIs established five executive committees as a platform to foster collaboration and coherence across various sectors and oversee the implementation of relevant work plans in coordination with various government and private entities at the national level. Executive Team for Health Regulatory Indicators. On national level, Prime Minister Office (PMO) periodically monitored all NKPIs including NCD-related KPIs to ensure their targets are achieved by 2021. All ministries and federal authorities are required to submit periodic analytical reports on the team's achievements, progress of initiatives, and NKPI-related results to the PMO. [Figure 3] demonstrates the process of monitoring the national agenda and KPIs. The UAE provided a positive response to NCD Prevention and Control, which is in line with the global commitment to achieve the goal of a 25% reduction in premature NCD mortality by 2025 and SDGs targets 30% by 2030. The National Agenda 2021 stressed the importance of integrating NCD Prevention and Control into developmental agenda, setting up specific NCD-related NKPIs to reduce NCD mortality and NCD risk factors. The agenda also emphasized the need to adopt a multisectoral, whole of government approach to NCD Prevention and Control and support the active engagement of all stakeholders working together toward achieving the national targets by 2021 and SDGs targets by 2030. To this end and to facilitate this engagement and contribution from all sectors, a national framework of accountability has been developed with regular or annual monitoring by the PMO. National NCD targets and indicators were mapped to federal and local development plans and aligned with the core mandates of portfolio for other nonhealth ministries and national authorities. Each federal ministry is expected to provide periodic report on the team's achievements, progress of initiatives, and NKPI-related results to the PMO. The response of UAE to NCDs characterized strong leadership, multisectoral approach, and national accountability framework often reflects an exemplary model for other countries to replicate. World Health Organization. Noncommunicable Diseases Country Profiles. World Health Organization; 2018. Available from: http://www.who.int/nmh/publications/ncd-profiles-2018/en/. [Last accessed on 2018 Oct 10]. Razzak HA, Harbi A, Shelpai W, Qawas A. Epidemiology of diabetes mellitus in the United Arab Emirates. Curr Diabetes Rev 2018;14:542-9. Razzak HA, Harbi A, Shelpai W, Qawas A. Prevalence and risk factors of cardiovascular disease in the United Arab Emirates. Hamdan Med J 2018;11:105. Razzak HA, Harbi A, Shelpai W, Qawas X. Risk factors of cancer in the United Arab Emirates. Gulf J Oncolog 2018;1:49-57. Razzak H, El-Metwally A, Harbi A, Al-Shujairi A, Qawas A. The prevalence and risk factors of obesity in the United Arab Emirates. Saudi J Obes 2017;5:57. Vision 2021. National Key Performance Indicators/. Available from: https://www.vision2021.ae/en/national-agenda-2021/list/world-class-circle. [Last accessed on 2018 Oct 15]. NCD Alliance. Stepping up the Pace on NCDs: Making 2018 Count. Second Global NCD Alliance Forum; 2017. Available from: https://www.ncdalliance.org/sites/default/files/Forum2017ProgrammeBook_FINAL_WEB.pdf. Last accessed on 2018 Oct 11]. Sustainable Development Goals. Transforming our world: The 2030 Agenda for Sustainable Development. Sustainable Development Goals; 2015. Available from: https://www.sustainabledevelopment.un.org/post2015/transformingourworld. [Last accessed on 2018 Oct 20]. World Health Organization. About 9 Voluntary Global Targets. Global Monitoring Framework for NCDs. World Health Organization; 2018. Available from: http://www.who.int/nmh/ncd-tools/definition-targets/en/. [Last accessed on 2018 Oct 10]. Minas H, Tsutsumi A, Izutsu T, Goetzke K, Thornicroft G. Comprehensive SDG goal and targets for non-communicable diseases and mental health. Int J Ment Health Syst 2015;9:12. General Assembly. Political declaration of the High-level Meeting of the General Assembly on the Prevention and Control of Noncommunicable Diseases. United Nations; September, 2011. Available from: http://www.un.org/en/ga/ncdmeeting2011/. [Last visited on 2012 Mar 06]. World Health Organization. 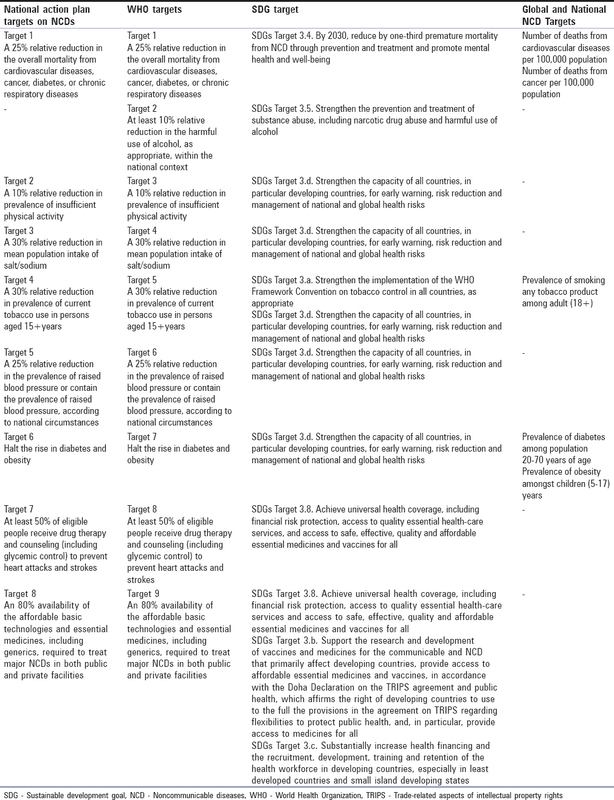 Global Action plan for Non Communicable Diseases Prevention and Control 2013-2020. World Health Organization; 2013. World Health Organization. From Soft Drink Taxes to Detecting People at Risk, the United Arab Emirates is Promoting Health by Beating Noncommunicable Diseases. World Health Organization; 2017. Available from: http://www.who.int/en/news-room/feature-stories/detail/from-soft-drink-taxes-to-detecting-people-at-risk-the-united-arab-emirates-is-promoting-health-by-beating-noncommunicable-diseases. [Last accessed on 2018 Oct 05]. Ministry of Health and Prevention. Ministry of Health and Prevention Holds Workshop on Non-Communicable Diseases. Ministry of Health and Prevention; 2017. Available from: http://www.mohap.gov.ae/en/MediaCenter/News/Pages/1878.aspx. [Last accessed on 2018 Sep 15]. Bonita R, Magnusson R, Bovet P, Zhao D, Malta DC, Geneau R, et al. Country actions to meet UN commitments on non-communicable diseases: A stepwise approach. Lancet 2013;381:575-84.